Sweden's extreme heavy metal act ARCH ENEMY has announced its return to North America, a headlining run on the North American Khaos 2011 tour, set to kick off in September. 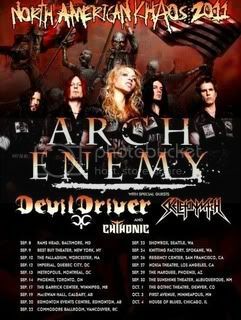 The North American leg of Arch Enemy's world tour will kick off in Baltimore on September 8th, and features an all-star cast of DEVILDRIVER, SKELETONWITCH and CHTHONIC in support. "We pledge to the United States of America and its beautiful neighbour Canada that we will only bring the utmost heavy metal Khaos to your shores!" said vocalist Angela Gossow. "We can't wait to kick off this tour come September. After all the European summer festivals, we are ready to fire!" Arch Enemy is touring in support of its first collection of new material since 2007, Khaos Legions.